IBS is a digestive health problem which can be triggered by the inability to digest certain foods. So you may be wondering, which digestive enzymes are good for IBS? In this article, I look at the science to explain which digestive enzymes you should use to improve your IBS symptoms. Digestive enzymes are proteins which break down your food so that you can digest it. You can mostly find these enzymes in your saliva, stomach and small bowel. Please note, before you read any further, most people DO NOT need to take a digestive enzyme supplement. Which Digestive Enzymes Should I Take For My IBS? Is Viokase Good For IBS? Viokase contains lipase, amylase and protease enzymes. There has been 1 study suggesting that taking 1-3 capsules before each meal reduces cramping, bloating, urgency of stools, stool consistency and abdominal plain in those with IBS-D (1 ). However, don’t get too excited just yet! The study has a couple of limitations which reduces the accuracy of the results, so you need to be cautious. There was quite a high drop out rate, meaning that the end results can be skewed to those who had more benefits from the enzyme. The study also used the old criteria for IBS. This means that there may have been individuals included in the study who do not have IBS. 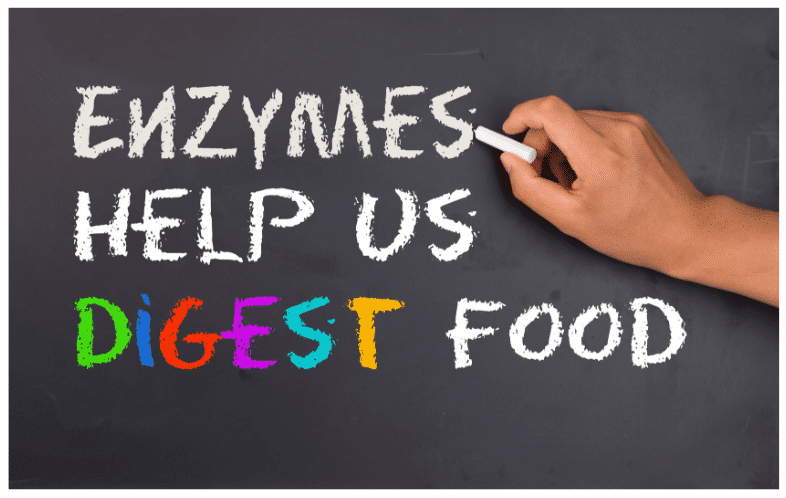 Will a Mixed Type Digestive Enzyme Improve My IBS Symptoms? Biointol is a mixture of amylase, amyloglucosidase, lipase, cellulase, lactase and pectinase enzymes. It also contains beta-glucan and inositol (soluble fibres). In a study of 90 individuals with IBS, Biointol was shown to improve symptoms of bloating, abdominal pain, flatulence and urgency to open bowels in comparison to standard treatment after 4 weeks (2 ). Unfortunately, the study does not rule out a placebo effect. This means that people may have just felt better due to strong belief that they were taking something beneficial. Will Alpha-Galactosidase Digestive Enzyme Help My IBS Symptoms? Alpha-galactosidase is an enzyme which breaks down oligosaccharides – a type of FODMAP which you may have heard about. These FODMAPs can be found in wheat, garlic onion and beans / pulses – foods which you may find cause you to bloat or end up with loose stools / diarrhoea. Many people who have IBS will be intolerant to this type of carbohydrate. In a small study, 8 drops of Beano was shown to reduce flatulence after a meal which would typically create a lot of gut gas (3 ). Strangely, you may be surprised to hear, there was no change in bloating or stomach pain reported in comparison to placebo. It is important to be cautious of Beano as it does contain mannitol (another type of FODMAP) which means it may not be suitable for you (read the summary for more explanation). In a 12 week study of 101 individuals, Nogasin was shown to reduce symptoms of abdominal distension and flatulence (4 ). However, the results were so small that they were not considered significant to be reliable. In a recent study, Vitacost Gas Enzyme was taken by individuals who were known to be sensitive to galacto-oligosaccharides (a type of FODMAP) (5 ). The study showed that 2 tablets before a meal reduce symptoms in comparison to placebo. Interestingly, only taking 1 tablet did not provide any benefits. This suggests that not only the type of enzyme, but also the dose is important to get symptom relief. It should be noted, however, that Vitacost Gas Enzyme does contain manntiol – another FODMAP. Should I Take Lactase For My IBS? Lactase is a digestive enzyme which breaks down lactose – a sugar found in dairy. Lactose is also a FODMAP . You become lactose intolerant when you are unable to produce enough lactase. This is the enzyme which breaks down lactose and leads to symptoms of diarrhoea, stomach pain and gas. If you are lactose intolerant, this may be permanent or just a temporary problem. You can read more about lactose intolerance here . Using a lactase enzyme can help you to improve or eliminate your malabsorption symptoms. The enzyme comes in 2 forms – droplets which you add to dairy or tablets which you take before eating dairy. In a study of 30 lactose intolerant individuals, a significant reduction in hydrogen breath concentration bloating, abdominal pain, flatulence and diarrhoea was seen in those who consumed 400mls contain lactase enzyme. 3000 UI of lactase had been added to the milk 10 hours prior. Interestingly, this dose and time reduced symptoms more than when double the lactase was used with only 10 minutes before it was drank (6 ). This suggests that there needs to be adequate time allowed for enzymes to work. Should I Take Glutenase For My IBS? Glutenase is a digestive enzyme which breaks down the protein gluten. Whilst the concept of glutenase is really exciting for many, it is useful for anyone right now. If you are wheat intolerant, you are actually reacting to fructans inside the wheat (a type of FODMAP carbohydrate). You are not reacting to the protein – gluten. If you have coeliac disease, this enzyme has not been proven to be safe. You can read more about glutenase here . When and How Should I Take Digestive Enzymes? Digestive enzymes should be taken specifically to digestive a certain food that your body can not digest itself. Taking supplements randomly will not work and could lead to you wasting a lot of time, money and preventing yourself from getting an accurate diagnosis. Enzymes must be taken with enough time to break down the food. For example, capsules should be taken at the start of a meal so they mix in your stomach with the food. Whilst lactase drops will need to be added to milk / yoghurt with enough time to allow them to break down the lactase. Dosing of enzymes will depend on how much of that food your are about to eat. 1 glass of milk will require more lactase than 1 scoop of ice-cream. The dose may also differ depending on how much of the enzyme your already produce. This means that you will need to ‘play around’ with the dose to find out what works for you. Please read the individual product description to get the correct dose and times. If you are at the start of your IBS ‘journey’ then you should not be taking digestive enzymes. Digestive enzymes are very specific to a type of intolerance, so taking them randomly or a mixture will not work. Instead, you need to complete the low FODMAP process and find out which intolerances you have. If you are at the stage of having been through the FODMAP process and you know which foods you are intolerant to, then yes enzymes may help for lactase and oligosaccharide intolerances. Just be aware that most digestive enzyme products contain other high FODMAP ingredients which could trigger your symptoms. Lastly, if your symptoms are due to a deficiency in pancreatic enzymes, then you will likely need a prescription dose of enzymes to manage your condition. So please do not take over the counter medications for this. See your doctor. As always, if you have any digestive symptoms, please do not self manage or diagnose. I highly recommend you see your doctor in the first instance. They can then rule out other conditions and provide you with an accurate diagnosis and management plan. Are You Having Problems With Food Intolerances? The post Which Digestive Enzymes are Good For IBS? appeared first on The Food Treatment Clinic .